Several months back I reviewed the Soliloquy 6.2 loudspeaker, and at their $2,495 price found them possessed of remarkable refinement accompanied with sure and steady tonality. This superb sonic skill aside, they were real music makers and so rated very highly both my analytical and groovalicious scales. Considering price, about the only thing they lacked, and this by design, was the last octave of bass. Since all speakers, except a select few, are a compromise, Soliloquy chose wisely in limiting bass extension as that delivered a speaker that worked more efficiently and with higher quality over the 40 to 20k hertz range that most music lives in. Of course, besides the obvious constraints that a price limit places on a speaker design, at least one other reason Soliloquy may have had for limiting the bass extension on the 6.2 was that they felt they had a superb subwoofer in the line that would match effectively with the 6.2 and let the bass, organ and sound effects dweebs have their fill. Since I am a sometimes dweeb, Soliloquy sent me that sub, the S-10, just as I was finishing the 6.2 review so I could see if their master plan worked. That report follows. But first things first, namely the obligatory product description. 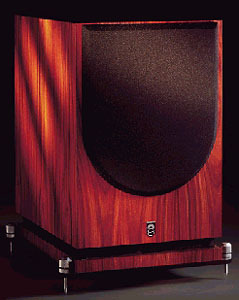 At 20 inches tall, 12 inches wide and 18 inches deep the S-10 falls neatly into the standard sub profile. But this is not to say that it is confined there. To begin with, although ported, a clever design allows for front or rear port orientation, and you can switch back and forth in a matter of minutes, which makes discovering which direction works best in your room an easy proposition. Next, the back panel amplifier controls are remarkably flexible. Want line-level input? You got it. Need to use a high-pass to protect your amp or main speakers? The line-level output with adjustable crossover will accommodate you. If you prefer, and Soliloquy strongly feels you should, the speaker level inputs take the signal off your amp, allowing for a better match between the sound of your main speaker and the sub. And, of course, the S-10 includes the standard volume control, phase control and variable crossover point selector. With this many options, if you can't get this thing to match your room and speakers, then I'm willing to bet nothing short of a custom built sub will. The driver, a 10-inch dual-voice coil aluminum model custom designed by Phil Jones, is powered by a 160-watt amp and sees an 18 dB slope on the low pass side. 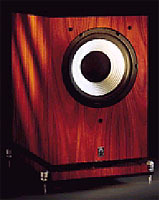 The review model was finished in the same maple veneer as the review 6.2 speakers, and with equal craftsmanship. And just like the main speakers, the S-10 comes with a solid metal bottom plate to which four supplied spikes attach to anchor the sub to the floor. In all, a very full featured sub for $1,395. With as many options as the S-10 has, I still found a way to try most of them. Moving the port from front to rear is a simple operation that involves removing (way too many) screws, rotating the base, and putting the screws back. In my room, with the amps I use, and with my musical tastes the rear firing port was a bit much and the front firing port was just right. I can easily see that some rooms and some main speakers would benefit from a rear firing port, and so applaud the Soliloquy design team for this innovative idea. As for response issues, I used a modified RatShack (Tandy) analog SPL meter and the Stereophile Test disc #2 to rough in flat response and then finished the job off by ear. I also freely admit that the Soliloquy folks are right about the line-level vs. speaker-level hook-up issue. Using the line-level input and output allows you to protect your amp and main speakers from low bass, which should allow for a seamless crossover between the sub and the mains and should also deliver higher SPLs as well since the main amp is freed of power-sucking bass responsibility. On the other hand, using the speaker-level inputs, in other words bring the sub up under the existing soundframe of your amp and speakers, feeds the sub the same tonal image that the speakers are getting from the amp, albeit at a loss of ultimate sound levels and with increased attention needed for proper setup. In my experience with the S-10 I found that regardless of the amp, speakers or wiring used, the sound was always more cohesive when using the speaker-level inputs, and that using the line-level inputs always gave the lowest bass a slightly different tonal spectra. The differences were on the subtle side, though consistent. Our debt paid to the spec and setup gods, how does the S-10 sound? When I first sat down to listen after all the prelim stuff, and when matched with the 6.2 speakers and the Art Audio Gill Signature amp, I heard not a thing. Since the 6.2 reaches to the lower 40s/upper 30s without strain, the need for augmentation from the S-10 is only occasional, so this is a very good thing. I look at it this way, if a sub has fantastic lower bass extension, articulation and slam, but also muddies the upper bass then you, or perhaps not you but certainly me, are better off without it. So, the S-10 passed my first test. Next test. For pure, spooky, if far from natural bass I often turn to the Lustmord album, The Place Where The Black Stars Hang [Side Effects DFX16]. A deeply scary industrial/ambient work, in places it creates a low-level, shimmering bass effect, or rather it can when the system is up to it. To get this right the deep bass must be powerful at low volumes, articulate and extremely well defined. Above all, it must completely avoid the typical one-notey sub sound. When all this happens the effect is as near to surround as two-channel can get, as the bass creates a soundfield that is truly enveloping. At other times, this same album pressurizes the room with claustrophobic, deep, throbbing bass. To get this task right, besides the previous skills, a sub simply cannot be fat at moderate and high volumes. The 6.2 loudspeakers by themselves were able to conjure up a moderate scare with this album, but when coupled with the S-10 the result was pure nightmare. It was only with repeated listening that I could find nits to pick (and why would I repeated listen to such a scary album? Because I'm an audio reviewer, so I already have a demonstrated lack of intelligence). First, even though the tonality of the main speakers and the sub were quite closely matched when using the speaker level inputs, the very lowest bass retained a slightly drier sound than the mid to low bass of the 6.2s. And second, I was never quite able to get the "slam" factor to completely balance between the two speakers. The mid bass had a touch more impact then the upper and lower bass, regardless of what I tried. However, this second issue was a very slight matter and one that really only showed itself when the music (or noise as in the case of the Lustmord album) was very active way down there. Moving on to more standard music, the Ginger Baker album, Going Back Home [Atlantic 82652-2], has a few choice whacks that a great sub can reveal, and on which the S-10 acquitted itself quite well. I also was not able to hear the lower-mid bass bump with this recording, which makes a great deal of sense as the Lustmord track goes deeper than standard musical instruments. Another deep bass fave is the Guru plus friends album, Jazzamatazz Volume: 1 [Chrysalis 21998 2]. Spin any cut and you can find some deep urban bass, but my personal favorite track is Le Bien, Le Mal with MC Solaar. I love to sit back and listen to the speed of Solaar, it is simply amazing. For our purposes, so is the bass work on the entire album. Consisting of largely artificial sound but with a fair amount of actual bass work, the deep stuff was nonetheless powerful and propulsive. With the S-10 in the system the walls of the listening room flexed appropriately, and the dance shoes got a nice workout as well. I briefly ran the S-10 in a two channel Home Theater setup to test the movie quality bass. Now I'm not much of a HT guy so please take these words with a large grain, or rather a whole shaker of salt. Whether playing The Matrix or Aliens (two of Robins favorites), or playing Ran or Pi where the low bass is music as well sound, the S-10 more than met my desires. I've had other subs in here that had a bit more of the loose sound that HT seems to occasionally favor, but for my money I'd rather hear the tighter and more defined sound of the S-10. As for depth, the S-10, at least in my place, never ran out of extension, even when compared to my memory of the $20,000 Wisdom Audio M-50 speaks that passed through here last fall. I know that a single 10" driver cannot fill a 25 x 35 space with 20 hertz sound, but my room isn't that large, and in my fairly standard room the S-10 was more than up to the job of 20 hertz bass at robust SPLs. After a long workout with the 6.2 speakers I decided to try the S-10 with my reference Merlin VSM-SE speakers. To start with I used the S-10 with the VSM and without the battery BAM module (the BAM is a bass augmentation device). In this configuration, and after a bit of placement work, I was able to get superb integration between the sub and the main speakers, with a bit less of the imbalance in the slam factor but with more of a tonal mismatch between the two speakers than I had heard with the 6.2s. This was due, in the latter case, to the greater purity of the Merlin speakers, and the former to the fact that they roll off a bit higher and a bit faster than the Soliloquy speakers and so were easier to integrate with the S-10. After a week or so with that setup I put the BAM in the system. Since the BAM, besides having a 6+ dB boost in lower mid-bass, also rapidly rolls the low bass off, it makes the Merlin speakers a perfect candidate for a true sub. After fiddling with the system I found the precise setup (and had a very precise position and dial set up to get it right) and the whole thing gelled. Impact across the entire bass range was seamless, and since the Merlins were handling all but the lowest bass, tonality was quite tightly matched as well. The S-10 is not alone, as it is similar in features and intent to the REL line of subs, although the adjustable port is something that the RELs do not have. I have heard both the REL Q-100E and the Strata II in my system in partner with the Merlin speakers. Working from memory I would characterize Strata as have a slightly more effacing personality than the S-10, with slightly less slam, but being a touch easier to integrate, while the Q-100E had a bit more bluster and a more obvious tonal character than the S-10. Looking at this from the other direction, the S-10 is more refined sounding than the Q-100E and offers a bit more impact than the Strata. From my viewpoint then, this makes the S-10 a better bargain than either of the two REL models. Not that I'm discounting the supremely musical nature of the REL subs, most especially of the Strata. It's just that the S-10 covers that same territory with almost equal skill while adding a touch more power, but without adding the slight coarseness of the Q100E. After a several month audition with the S-10 I was very surprised at how easy it was to match with several speakers, not in spite of but rather directly because of its flexibility. With two speakers that offer different tonal spectra at the bottom of the range the Soliloquy sub was able to match, while not perfectly, certainly well enough that I was more than satisfied with its performance. It goes very deep for a 10" driver and remains articulate at high and low volumes, has superb slam, and, especially when using the speaker-level inputs, retains the tonality of the main speakers. At $1,395 it is a wonderful partner to the Soliloquy 6.2 speakers, bring the combo to less than 4 grand for true 20 to 20k sound. And as good as that combo was, the S-10 paired up even better with the full-blown Merlin VSM-SE BAM combo, a $7,100 speaker! That's excellent versatility. And that, to these ears, makes the S-10 as nice a surprise and value as the 6.2 loudspeakers. either a front or rear fire port. Amplifier: Discrete Darlington circuits provide high current while remaining stable to nearly a 2-ohm load. Filters: second order active crossover with Linkwitz-Riley networks; second order subsonic; continuously variable low pass; and, a high pass for satellite outputs.